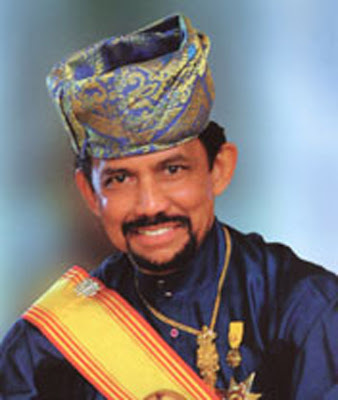 His Majesty Sultan Haji Hassanal Bolkiah Mu'izzaddin Waddaulah, the Sultan and Yang Di-Pertuan of Brunei Darussalam, is the 29th of his unbroken royal blood line, which dates back to the fourteenth century, and perhaps even long before that of recorded Bruneian history as mentioned in ancient chinese texts even before the year 518. Being the eldest son, His Majesty became Crown Prince in 1961 and ascended the Throne on 5th October 1967 following the voluntary abdication of his father, Al-Marhum Sultan Haji Omar Ali Saifuddien Sa'adul Khairi Waddien.His Majesty the Sultan was crowned on 1st August 1968 in pomp and pageantry befitting Brunei's ancient customs and traditions. His Majesty was born on 15th July 1946 at the Istana (Palace) Darussalam in the capital, Brunei Town (now Bandar Seri Begawan). He received his early education in the form of private tuition at the Istana Darul Hana and attended top institutions in both Brunei and Malaya (Peninsular Malaysia) before furthering his studies in the United Kingdom where he later qualified for admission as an officer cadet at the Sandhurst Royal Military Academy and was commissioned as a Captain in 1967. He left Sandhurst in October of the same year to ascend the throne. Besides being the Sultan and the Ruler, His Majesty Sultan Haji Hassanal Bolkiah is concurrently the Prime Minister, Defence Minister, Finance Minister, and head of the religion of Brunei Darussalam. Being a working monarch, he is involved in the conduct of the State affairs internally and internationally. Like his illustrious father, who is fondly remembered as the Architect of Modern Brunei, His Majesty is a caring monarch and tirelessly works for the continued well-being of his people. In addition to the usual day-to-day administration of the government and receiving foreign dignitaries. His Majesty is always on the move, visiting government departments and related institutions, security forces on military maneuvers, and villages including remote parts of the State. This brings him very close to the people, who love and revere him. The promotion and strengthening of relations with the outside world also get top priority from His Majesty. He has traveled widely in Southeast Asia, East Asia, The Middle East, Europe, and the United States. He addressed the United Nations General Assembly on Brunei Darussalam's admission to the UN in September, 1984. His Majesty takes great interests in sports, including polo in which he has excelled in matches against international teams both locally and outside of the State. One of His Majesty's remarkable achievements was the setting up of the Sultan Haji Hassanal Bolkiah Foundation in 1992. The foundation is a gift of His Majesty to his people and is devoted to, among other things, financing research-related works, particularly in the fields of knowledge. I am blessed with the grace of God to be born under the rule of a monarch that stands and walks proud among his people. 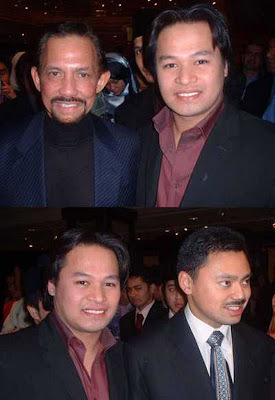 On the 2nd December 2007, His Majesty Sultan Haji Hassanal Bolkiah Mu'izzaddin Waddaulah, the Sultan and Yang Di-Pertuan of Brunei Darussalam invited all Bruneian students and his subject who are currently posted or studying in the United Kingdom and Ireland to attend one of his regular visits to meet his people in the UK and Ireland. Every Bruneian through thier convinience from all parts of the UK and Ireland attended the event at the Intercontinental Hotel in London. Most of the people arrived as early as 10am in the morning. We enjoyed the food and minggled around and met friends studying in different parts of the country. His Majesty and His Royal Family arrived at 2pm. Everyone who came waited impatiently to take pictures as he passed by to the podium. After the Doa (religious recitation) and a few words by the Bruneian Student Body's President, it was His Majesty's turn to to address his visions and views for Brunei's future, in essense the role of the students stying in the UK. After His Majesty's address, he looked around for a bit and then continued to walk down from the podium and toward the crowd. Most people was shocked to see this and some froze while others rushed towards him to shake his hand and take pictures. Most of those who were abit shocked to see this because in Brunei, there are protocols on how to address and speak to His Majesty, imagine this, you are just standing there, then His Majesty just walks up to you reaches out his hand to shake your hand, speaks and walks with you not as a ruler but like someone he knows; this is how he made everyone in the room felt, a feeling of admiration and pride. Knowing our boundries, shaking hands with us, taking pictures with us and spoke to us, he walked amongst us, amongst his people. A few years back I had a chance to take a picture with His Majesty and His Highness the Crown Prince. These are one of the highlights in my life - frozen in time and I am proud to show them off. I would like to apologize for any and all mistakes made in this article/post. Any and all mistakes are entirely of my own, I do not mean to disrespect but express my admiration and pride for His Royal Majesty and the Royal Family. Please do not take any of the images or words that I say in any negative way.